be quiet! 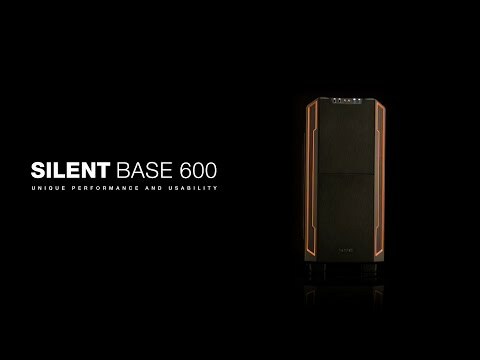 Silent Base 600 Black offers the perfect symbiosis of noise prevention and cooling performance, good usability and extensive capacity for high-end hardware. be quiet! BG006 (Black) Silent Base 600 Mid Tower Gaming Case, ATX, 2x USB 2.0 2x USB 3.0, 2x Pure Wings Fans is rated 5.0 out of 5 by 4. Rated 5 out of 5 by FrankS from Perfect case for assembling a gaming PC Very sturdy case for high end gaming PC. Every panel is removable for perfect and easy assembly. This case also has CD/DVD bays, unlike some new cases that don't provide this. Rated 5 out of 5 by Mr17 from Excellent case Very good quality case, quick delivery and efficient service from Scan. Rated 5 out of 5 by joe45 from Very flexible and easy to work with A bit boxier than most mid tower cases but the extra few cm is great for fitting big heatsinks. Loads of room and comes apart with ease. I am liking it more and more as time goes on even more than my Antex mid tower case. Rated 5 out of 5 by Todorov from exellent case The case is very silent and beautiful i would highly recommend!